Your webinar’s recorded and uploaded to the Web — what’s next? James Schramko and Jarrod Robinson continue their 3-part series on using automated webinars to leverage time and effort in your marketing. In this episode: landing pages, traffic and remarketing. 00:36 – Ready for this? 04:25 – Why not 7 days a week? James: James Schramko here, welcome back to our How To Use Automated Webinars In Your Marketing series. I’ve invited back my special guest Jarrod Robinson. Jarrod: Thanks, James. Thanks for having me back. James: Now, you recall Jarrod in Part 1, we talked about automated webinars and how magical they are, how they’ve been improving your business, what sort of show-up rates you’ve been getting, how you’re helping more people without even having to be there, which is just amazing. And we talked about how you actually put together a webinar and load it up to the Internet. And we talked about software that we’re using for that. So if you haven’t listened to Part 1, please go back and listen to Part 1. But for now, in Part 2, we’re talking about how we do the landing page to register people for automated webinar, and we’re going to then talk about how we drive traffic to that landing page and some of the funnel steps that are there. So are you ready to do this, Jarrod? Jarrod: Absolutely, the best part! James: Alright, so we’ve loaded up our media to our Web server or video player of choice, we’ve gone into our webinar software, we’ve played around with some of the configurations, in this case we’re using EverWebinar. So now we need to set up a registration page to bring people into the webinar. What are we going to be talking about today? Jarrod: Absolutely. So, I mean the first thing that I tend to do is I go and reverse-engineer the actual webinar that I’ve done, and list out the key learnings that they can get from it. And they become the bullet points that then will go on the landing page. And at this stage, you could use something like Thrive Themes, or you could use LeadPages to build out a quick landing page, or whatever other landing page creation tool that you use. And the important part is that you make it very clear so that the person knows what they’re about to get from the webinar, I think that’s good practice. And you need a Register button. And the Register button is what they click on, which would then opens up the login form that EverWebinar gives you, and that’s the special form which will track where the person actually is and give them the registration options based on their time zone, which I think is a really powerful feature that can be used to your advantage. James: So it’s geolocation technology. James: So what have you found works well for you in terms of session times and days of the week? Jarrod: So for me, dealing with teachers, I tend to provide a couple of choices for each webinar, knowing that they can probably make some, and not others. And I try and stagger those times. So on a Monday, I’ve got a 10 a.m and a 5 p.m., and on the Wednesday I’ve got like a 9 a.m. and a 4 p.m. So it gives me four different times that they might be able to access it at. And I pick the school time because schools tend to provide teachers with a little bit of leeway that they can do some professional development in, so it’s sort of knowing my audience and knowing when they’re likely to be able to achieve it. In your space, it might be a completely different time. So I think you need to look at what your audience is likely to respond to and test it. And again, I shouldn’t assume these things, but having been a teacher, that’s sort of where I’ve got that insight. James: So it comes back to knowing your audience. James: And perhaps you’d try a couple of options. James: Why 2 days a week and not 7 days a week? Jarrod: I don’t know, I mean I think it just came down to knowing that if I provided a few less options, then there’s more incentive for them to get on and get a result rather than trying to delay it and maybe going, oh, I can do it another day. Just creating a little bit more scarcity around it. James: So it seems a little more special. Jarrod: I think so, because if you’re doing it every day, then it becomes apparent that maybe it’s not quite as exciting or important. And the cool part about it is that it’ll only show the next sort of four upcoming sessions, so when they click on the link it only presents them with four. It doesn’t give them the whole month worth of options, so that they really do have to make a choice between maybe four choices, and they don’t see what happens until it cycles out. James: Right. That’s very clever. So just a quick recap, you’ve looked through your own webinar, you’ve jotted down the key learnings as bullet points. Now you’ve got some landing page software, whether it’s Thrive Themes or LeadPages. You let people know you’re about to get, and then you have a Register button, and that’s where they put in the form. I actually had a really high-converting webinar registration page template on LeadPages, and I think they let people use it if they’re a member for free. And it was for the longest time the highest converting template on their marketplace. Jarrod: I actually use that exact one. 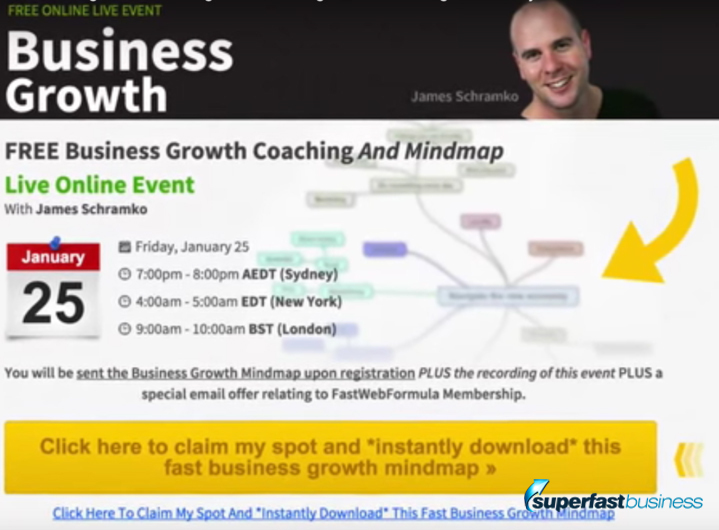 James: So you can get started fairly easily, by just going with a proven framework. James: So now we have to drive traffic to this. Is this something you drive traffic to directly, with cold traffic, or do you have this somewhere else in your funnel? Jarrod: I do a little bit of both. So as soon as I get that webinar created, it’s an opportunity for me to email my list of people who are already on the list who are not members. So it’s a high-value thing that they can get onto, and they’re going to get a pitch. So the first opportunity is to give it to those people. But then, most of the magic comes from the cold traffic, and that’s the figures I was talking about before, was from cold traffic. So I’m always continually amazed with the results that we get. But the first step in that process is, you know I use Facebook ads for this purpose, I’ll create a nice advertisement using Canva, the website, and it’s just a nice image that showcases the result that I’m hoping to get for that person, with an arrow pointing down to the signup box, which takes them to the registration landing page, and then we target specific groups of people who are Phys Ed teachers or whatever other subset that I would like, and I throw some money down for that on a daily basis. And we find that we get some good registration turn up and so forth, based on the cold traffic. James: Fantastic. OK, so which would you recommend is going to be the most effective for people to start with? 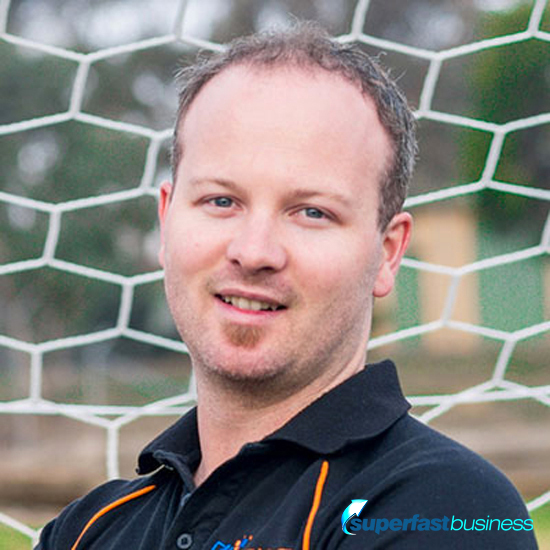 Jarrod: They can definitely create an ad with Canva really quickly, it’s all free, but we’ve found that the best rates we get for cold traffic is by not offering the automated webinar straight away. So I’ve experimented with both before. What we’ve done is we’ve actually put in a free PDF guide first, so that they get the ad that’s relevant to them, and the PDF guide is also relevant to the webinar which we’re going to give to them later on if they manage to sign up. So we’re getting a much cheaper conversion, at around about 20 to 30 cents, for the free PDF cheat sheet, which is really easily consumable. And then they go into the thank you page for that particular PDF, and it says, hey, you know, thanks for getting your PDF, check your email, and by the way, we’ve got a free webinar which you can get access to now to take this PDF to the next level. And we found that’s the best approach for getting people into these automated webinars, because it’s cheaper and if they don’t sign up, then we’ve still got them on the list. James: Right. Fantastic. So are you using remarketing in your campaigns? Jarrod: We do. So at this step, let’s say the person’s landed on the page and they’ve got the PDF, then they go on to a list in our autoresponder called PDF List, or whatever we happen to call that, for whatever webinar we’re running. And we use this service called SyncSumo, and SyncSumo is a service that you connect your Facebook ad account up with your autoresponder, and when someone gets added to that list, the PDF list, they get synced as a custom audience in Facebook. And what that means then is we can create ads for that custom audience for the next step in the process. So essentially, the person lands, they get the PDF, they get synced to this other custom audience, and all of a sudden they start getting ads delivered to them about the webinar that they could get access to. So yeah, we do, we target them based on what audience they belong to, and we use SyncSumo to make that happen. James: So you’re basically constantly tuning the people that you’re talking to with the right message at the right time for the right stage of where they’re at in your process. Jarrod: All on automatic, too. So back in the day, you would have had to manually upload people from lists to Facebook to create those custom audiences, but with SyncSumo that happens hourly. So as they’re moving between lists in your autoresponder, they’re syncing between different audiences in Facebook and as a result they’re getting different ads, or they’re no longer seeing an ad, because they’ve left that audience, so it’s just a magic automation machine. James: Right. So once you’ve got the registration page, and you’re building up the list, I imagine some people register but don’t come. You’ve mentioned that you get about 60 percent show-up, and then you had quite a lot watched to the end. Do you have different follow-ups for people who register but don’t show up, show up and don’t watch it all, and then show up and watch the whole thing but don’t buy? Jarrod: Absolutely. I think you need to approach all of those situations uniquely. So they’ve all got different ways that you can communicate to them, and we’ve found that we try and communicate very clearly and tell the pitch more prominent in the funnel of the person who’s turned up. So the cool part about EverWebinar is it’ll track how far someone got into your automated webinar, and it will apply specific tags to that action. So for us, our pitch starts at 55 minutes. So when someone hits that particular spot, we apply the tag called, “Saw pitch, 55 minutes,” whatever it may be. And that can then follow up with more details. But for someone who doesn’t turn up and see the whole thing, they might get a different tag and it takes them down a different path. So I think knowing as much as you can about what they’re doing when they’re on the webinar is really powerful for getting the best result. And to ensure that we get those high show-up rates, we’re actively communicating with people. So from the automated webinar software we can send out a reminder email, and we do that 24 hours instantly after they’ve registered, we do 12 hours, we do 4 hours, 1 hour and a 15 minutes. So it might be overkill, but it’s definitely helping them. They’re all sort of different as well, the way that we communicate in those reminders, and we’ve seen some good results because of that. People are constantly getting reminded. You could use SMS as well, if you happen to capture SMS, and I guess that would increase show-up rates also. James: Well, that’s certainly good. Depends how local your audience is and what software you want to integrate with. But all of these things are possible, and I think, just starting out, you just start with the basics and then you can add complexity as you go. I wouldn’t map out a super complex series of things because it might actually prevent you from getting any of it set up, right? Jarrod: For sure. So we started super simple, which was just delivering the webinar and having two choices: for people who turned up, and those who didn’t. And then once we sort of got a bit more comfortable with it, we started adding in the tags based on their actions. And that’s when we started to see the results really skyrocket, because we were actually communicating to them more specifically. But the cool part about it is, I mean we’ve spoken about some pretty advanced stuff, but the software makes all of this really achievable. It takes you through this nice step-by-step process, I mean anyone can really make it happen, and it’s really sort of intuitive, and I think that’s part of the success. A previous software package that I used, that did all this stuff as well, I couldn’t even remember how to make this stuff work, and had to keep going back to tutorial videos and it was a nightmare. And the net result was I just didn’t get out as many webinars, because of how difficult it was. This has sort of changed the game. James: Well, I think you’re quite a technically-savvy sort of person, and a lot of people listening to this are going to instantly freeze up when it comes to anything tech, so you’re going to have to reach out and get help with this if you want to make it sing. But at the same time, there’s a very good lot of evidence that it performs so well that it really could give you a good return on your investment if you have to pay to get it set up. But for now, start super simple. Let’s just tie this up and see where we’ve come. So part one we were talking about automated webinars — why we do them, best practice, how to record them, where to upload them. This series Part 2, we’ve just talked about making an ad, driving traffic to your landing page that collects details on a certain schedule of days of the week and times of the day. We talked about incorporating a PDF and thank yous and some segmented emails and following people up to ask them to attend. Have I missed anything? Jarrod: No, you’ve covered it perfectly. James: Right, so what we’re going to do in the next part of this series is we’re going to talk about some of the advanced automation/chat options that we could choose. We’ll talk about the hybrid automated webinar, and some extra follow-up emails that might optimize your campaign. So Jarrod, thanks for popping onto this episode. James: You want to find out what Jarrod’s up to, go and check out workwithjarrod.com, and Jarrod and I will be on the next podcast episode talking about this final part of How To Use Automated Webinars In Your Marketing. I’ll see you there. I’m really digging this series. Thanks for sharing your insights lads. I’ve been having some success using Webinar Jam and Leadpages to sell memberships and Ever Webinar is the next logical step to automate this process. Absolutely Garry. Also remember to take it back to all of your prior buyers. Lets catch a few waves!